ChristineCreations: Making a Multi-Coloured Bouquet Work + Video! Hello Friends! 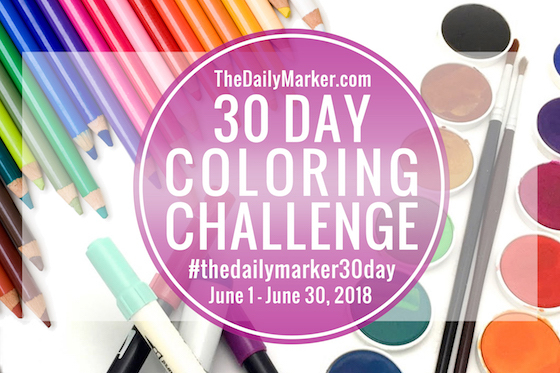 Today the Power Poppy team is joining together to play along with Kathy Racoosin and her Daily Marker 30 Day Colouring Challenge! Today I wanted to show you more of my process of making multi-coloured bouquets work together, so I actually have a tutorial video and two cards to show you! Now, if you’ve been here a while you know I don’t do videos regularly, but lots of people have been asking to see how I colour. So, it’s NOT super fancy, and I’m using evening light - so it could be brighter, but you’ll see a bit of my colouring process. Even though I can’t see you when I’m shooting the video, I’m still imagining you as I’m talking. And it sometimes makes me forget my words! Hopefully you’re entertained! 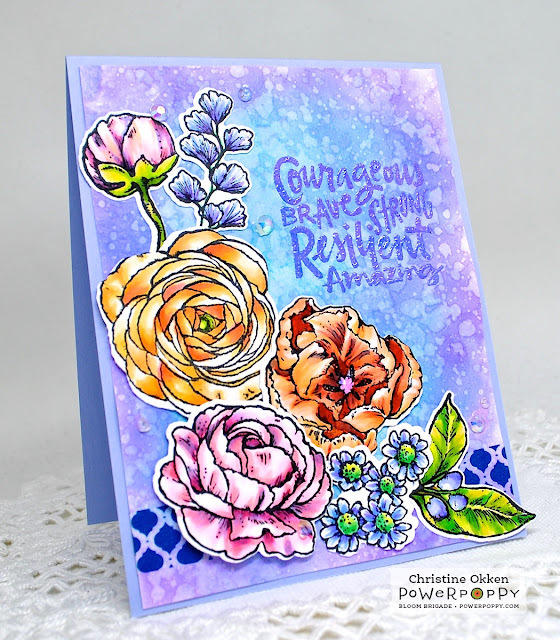 I’ve used the gorgeous new set Abundant Petals. It is amazing how much Marcy packed into this stamp set. It’s double a normal sized set, and the different flowers she chose are so beautifully done! It makes a colourist so happy! What my video shows you, is how I take a floral bouquet which has many unique colours in it, and make it tie together cohesively. I was inspired by this photo of a wedding bouquet. Amazing isn’t it? 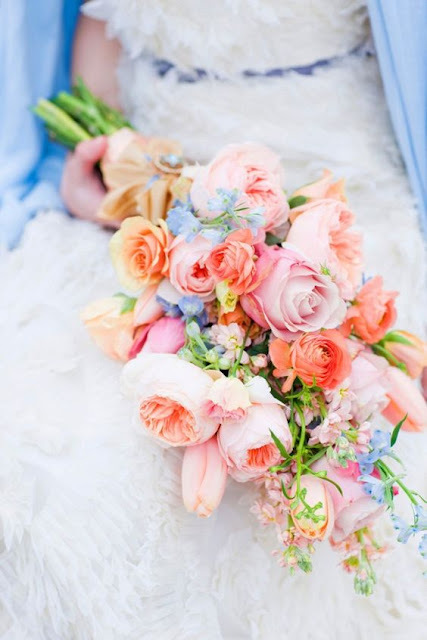 I love the soft colours, and yet there are really a lot of different colours in the bouquet: pink, coral, yellow, orange, blue, green. My wedding bouquet was a lot like this - though probably brighter deeper colours than these pastels. I love the vibrance of a lot of colour, it’s also how I seem to colour everything! So, when I’m putting together the bouquet, each flower has it’s own distinctive colour, but it also has elements of a number of the other colours in the bouquet mixed into each flower. By doing this the flowers work together. You can take a look in the video..
Here’s the second card I made, put together with the initial “single color” colouring of each petal, and then in the video how I added some of the different colours in the bouquet to each flower. Both cards make use of Distress Ink, or Distress Oxide backgrounds. I’ve just started to play around with those, and it’s fun to see how they turn out! I’ve embossed that empowering sentiment from Marcy’s new set M-Powering Words. Man is that set awesome! I love the words, and Marcy’s fabulous hand lettering. 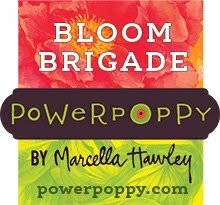 Now for a bit of SALE news, which is always fun....Marcella is offering a special on two stamps sets, Burst of Kindness and Spring Meadow , Marcy has more on that in the Power Poppy Blog post as well. Sale ends June 9th! Christine, if you read my post today you might get a chuckle. I should have watched your video before I started coloring! This is absolutely drop dead gorgeous and so fun to see your work in progress -- what a treat! release, and this was one of the sets I chose. Really looking forward to getting my "coloring on!" Wow - your flowers are just gorgeous!! I love the detail added to the stunning blooms with the depth of color you achieved. Thank you for sharing your video, I know it takes time to put the video together and I appreciate it! I love your wild array of flowers! What a happy card! Thank for the instruction. It is useful information for the amateur! So beautiful! I love the technique you used to make them gontogether well! I’m always afraid to match different colors but I’m going to have tonteybhis!! Beautiful coloring on these cards. So very pretty and love the backgrounds as well. Thanks for making a tutorial for us. Both cards are so pretty! I love the multi-colored flowers! You make it look so do-able! Thanks for sharing. Wow - both cards are beautiful! love your blog and thank you for the tutorial. WOW Christine, your flowers are stunning, especially against your gorgeous Distressed backgrounds. That really made the flowers pop! Beautifully done! Both of your cards are gorgeous! Thanks for sharing your tips on coloring flowers and how to make them tie together :) This looks like an awesome stamp set! Great tips to make it all work so beautifully together. Thank you so much! Oh wow, oh wow, oh wow! Your colouring is absolutely amazing, I love your creations. True, you have a great image to work with, but your colouring skills definitely brought the stamped image to life! I love your beautiful card Christine! Great coloring! Thanks for including a video too! Beautiful cards. Love the bright, vibrant colors. Going to have to check out these stamps. This is my first time visiting your blog. Lovely cards and wonderful tips. I'll be back! Gorgeous! You are an expert with floral designs! I absolutely love your beautiful cards! Love your tips for tying all the colors together. Thanks for sharing this lovely card. Wow Chirstine what a gorgeous cards, I fell in love with the awesome stampset you used for them. And what an incredibly educational video, thank you so much, I learned a lot from you. Wow! The flower bouquet, the colors you chose along with your coloring skills... WOW!! Wonderefully done, Christine!! I always love your cards; and these gorgeous floral with the distressed backgrounds are no exception!! I am always intimidated to take on a larger bouquet; but you make it possible with the video! Thanks so much for taking the time to show your creative coloring process. And it's always good to hear your sweet voice. 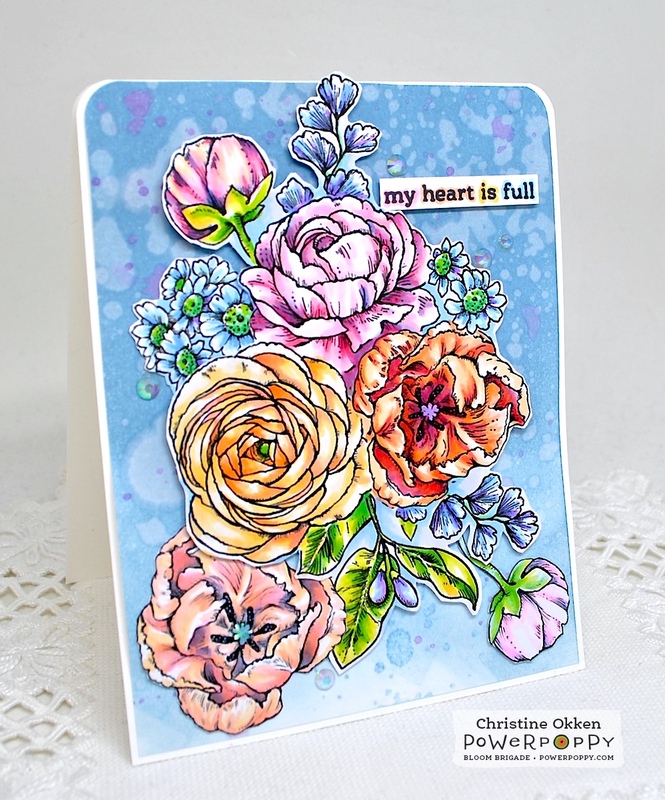 I love your cards - your coloring is beautiful and I also love the Abundant Petal Stamp Set. Love your video and coloring - absolutely beautiful. I'm also loving the Abundant Petals stamp set. Great job! Thanks for doing the videos, as I know that they are not easy and that they are time consuming, but they really help a "visual" person such as myself. Really good lesson, explaining. I learned a lot! (lovely card, too). Stunning! I love how you mixed the colors of the flowers and made them all work together. Thank you for the video! This is a beautiful set of stamps. Lots of ideas come to mind. A definite must have. Your cards and instructions were right on. Wow, gorgeous cards! So beautifully colored and the backgrounds so perfectly highlight your floral sprays. 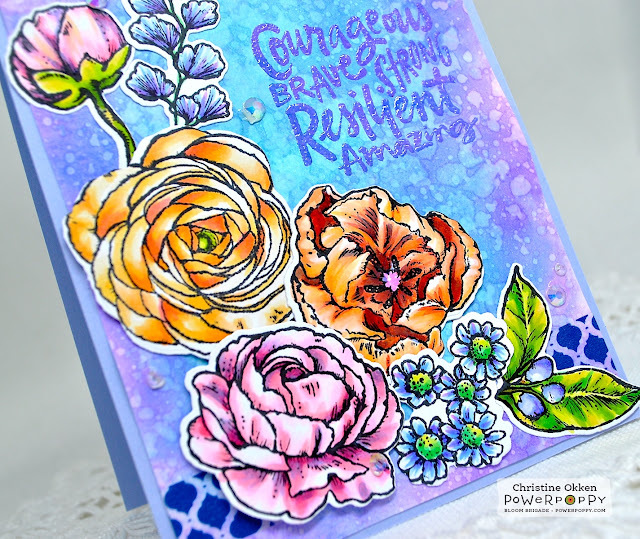 Fabulously beautiful coloring and love the final card with the distress backgrounds. Totally inspiring. The colors you used in this are just gorgeous. You have a very beautiful style. Beautiful cards! I really enjoyed seeing your coloring process on how you made the many flowers work well together. Gorgeous coloring of this awesome image! Beautiful card. Thanks for the video explaining how you tie the colors of the flowers together. thanks for the tips on making the colors coordinate in that lovely bouquet! these beautifully colored blooms layered over your blue background just pop!! So beautiful! I appreciate you taking the time to show use how to tie our colors together. Great tip and a great video! Gorgeous cards - thanks! That is such a great tip! I’ve always wondered why my different coloured bouquets look so awkward! I’ll be using this tip in future! That is such a great tip! I’ve always wondered why my multi coloured bouquets look so awkward. This is a gorgeous bouquet of flowers love the video explaining how you colored!! Thank you for this beautiful card!! WOW Christine - this is absolutely GORGEOUS!!!! OMG! This is AMAZING! So much detail! I love that you matched it to the photo! Your cards are amazing! I hope I can color like that some day! Beautiful! So very wonderful. Great tips. I love Poppy Power stamps. oh what pretty coloring! I absolutely love the background also! The real bouquet is beautiful. Oh my I am drooling. These cards are beyond gorgeous! What amazing coloring! 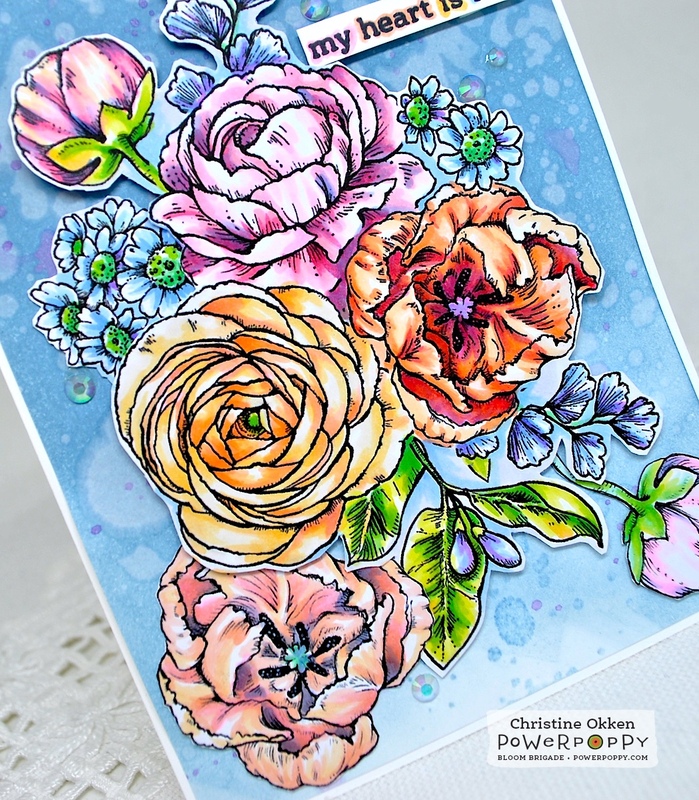 Your card is beautiful -- love how you created the background as it really makes your gorgeous flowers zing! This was such an instructive video! I've been thinking that my collections of flowers have looked really separate recently, so I'm definitely going to try some of those unexpected colors that show up in the other flowers to see if I can make it all more cohesive. Thank you so much for sharing with us! Gorgeous card and coloring! Love the background! Gorgeous! Love your inspirations photo too! So pretty and love all the colors. Both of your cards are gorgeous, your bouquets are so beautifully coloured and I love your colour choices! Thank you for your tutorial with the fantastic tips. I <3 Power Poppy flowers. I love to practice coloring them, your milti colors are grand! So pretty - love your coloring. The background really makes the flowers pop out! Love both cards! The pastel flowers look absolutely gorgeous with the blue background. These cards are just beautiful!!! I just love where you got your inspiration. This set looks fantastic it may be my first purchase of power poppy. I love both of the cards and your video was great, you should do more. This is a beautiful card, Christine! I love your light, fresh, airy style. Simply lovely! So bright and cheery! Made me smile! Beautiful cards! Love the wedding bouquet picture and the card you created from it. I've never been on your blog. I love the name (obviously because my name is Christine). You do beautiful work! Stunning! I love that stamp set. Thank you for all the amazing tips, tricks and inspiration. This is a real color burst therapy.Pretty!! Your cards are simply breathless!!! Beautiful - both card and bouquet! ImI in admiration of your coloring skills. Christine I highly enjoyed your video! Very informative and I learned something new today! Thank you! Your coloring and finished card .. just GORGEOUS! Wow! Your coloring is incredible! I really appreciate you sharing your tips for creating cohesive bouquets. I can't wait to put them into my practice! Thank you! Hi Cristina, after you explained your technique, it made perfect sense! This stamp set is goegeous and I love the card you put together. Thanks for sharing. Your card is beautiful. The colours all work together so well. your coloring is so beautiful. Love that stamp set. Beautiful card. Beautiful. Thanks for the tips on making all the flowers in a floral piece cohesive. I love your work. Thank you for sharing all your tips! I absolutely love the bouquet you chose as a reference! Both cards are spectacular! Oh My!! Both of these are just stunning!! Thanks for the very useful video. Wonderful coloring on all your cards. Beautiful cards... especially love the backgrounds! Simply beautiful. Thanks for the tips on making colors work together. I like pastels - so soothing. Thanks for sharing your video. Now up to my hideaway to do some coloring. Wow, talk about vibrant! This is absolutely, drop dead gorgeous!! Both cards are gorgeous, and I love how you incorporated the soft backgrounds. Your cards and coloring are amazing! I love the inspiration pic and that stamp is gorgeous! Beautiful card! Thanks for the great tips. Oh my, this is stunning! I love the colors! Your card is so beautiful Christine! And the way you laid them out showcases each flower. Thanks for sharing your technique. Your cards are absolutely gorgeous! I love lots of colors and you really brought it with these cards. Thank you for the inspiration! I need to pick my jaw up from the floor. This is absolutely beautiful! Color is my drug. The more, the better😊. So lovely!! Your coloring is fabulous, such detail! Beautiful cards. I had to immediately go and order that encouraging sentiment set! this is beautiful. It's so inspiring to see what other's create and especially when they are fantastic! Wow what a stunning card...love your inspiration. Your colors are absolutely beautiful! a on your fabulous cards! Two beautifully coloured cards and I like the fact that you used a wedding bouquet as your inspiration for the colours you used. Beautiful! Thanks for showing how you colored the images to make a cohesive look! Love the backgrounds! Really like the blue backgrounds! Love these cards, gorgeous coloring! Gorgeous! I love the mix of colors and the background! Thank you for showing us your colorful cards and for giving us the chance to win something. I can't wait to win something! Your coloring is absolutely gorgeous! Thank you for sharing your inspiration piece. I always love to see where artists find their inspiration! Oh my! I love Abundant Petals and I love your coloring. Thanks for sharing! Enjoyed the video. I love that we can color flowers any color we wish for a bouquet. I also love how you add the colors to make the bouquet blend together. Brilliant! TFS! Absolutely lovely!! Thank you for sharing. Awesome video and I like that you can color flowers or ferns any color you want to make it work for your card. I like this awesome flower stamp it looks like it would be fun to create beautiful bouquets. Thanks for the video. Your card is stunning. Woweee your flowers are stunning!! Thank you so much for sharing your talent. Your bouquet arranging skills are fabulous! Your coloring is amazing as well. I love it! It was so great to see you coloring, I learn so much better from video than writing instructions, gorgeous coloring as always, love the design on both cards! So colorful and cheerful Christine! I like the arrangement and the embossed sentiment is so cool.